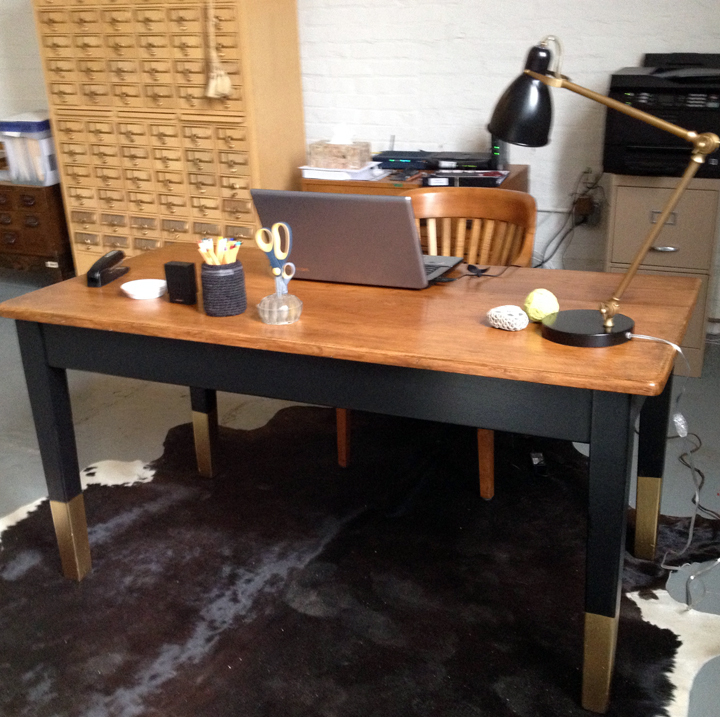 I purchased this old oak library table to use as my desk at the studio. It was in rough shape and I didn't like the orange-y stain color that it had acquired over the years. The top was stripped and sanded, and given a coat of General Finishes walnut stain. Three coats of General Finishes water based poly, and it looked great. Lots of patina and a much better color. Although in my quick iPhone photos it still looks a bit orange. 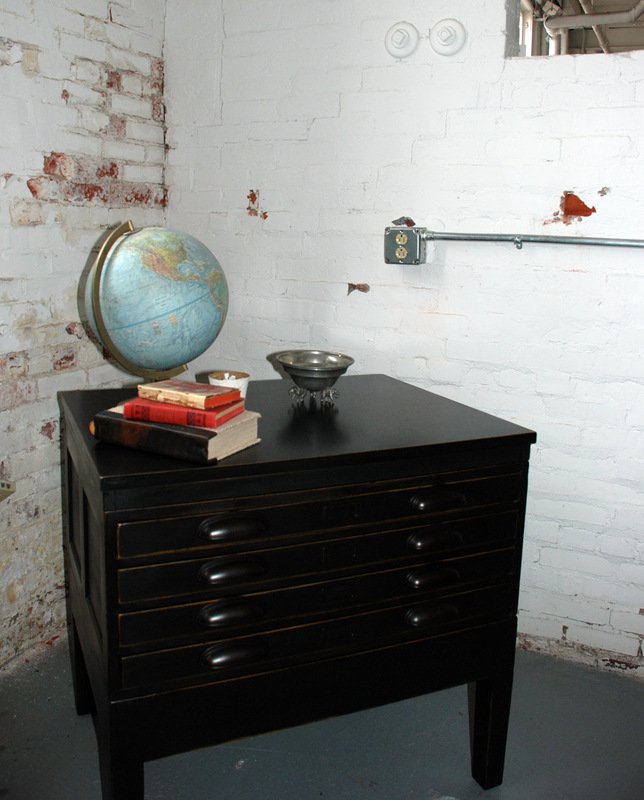 The drawers and bottom were painted in General Finishes Lamp Black milk paint. I love this stuff. It went on beautifully and covered completely in two coats. Next, I taped off the legs about 8 inches up and sprayed the bottom of them with Rustoleum's Metallic gold. 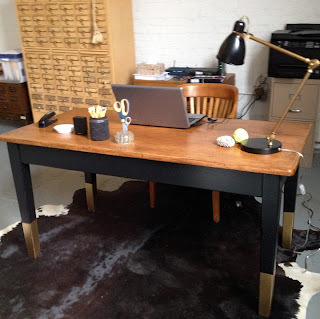 It was fun and easy and gives this desk an unexpected edge. 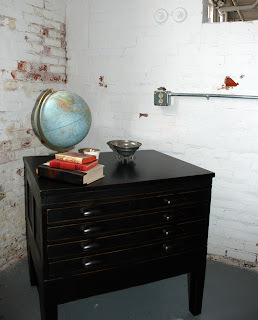 The West Elm lamp I had is just perfect with it, since there is no overhead lighting in this corner. Lots of light from the windows though on bright days. In between getting the studio ready, I have worked on some pieces that my husband has restored, like this map file drawer, originally used by the Department of the Interior. 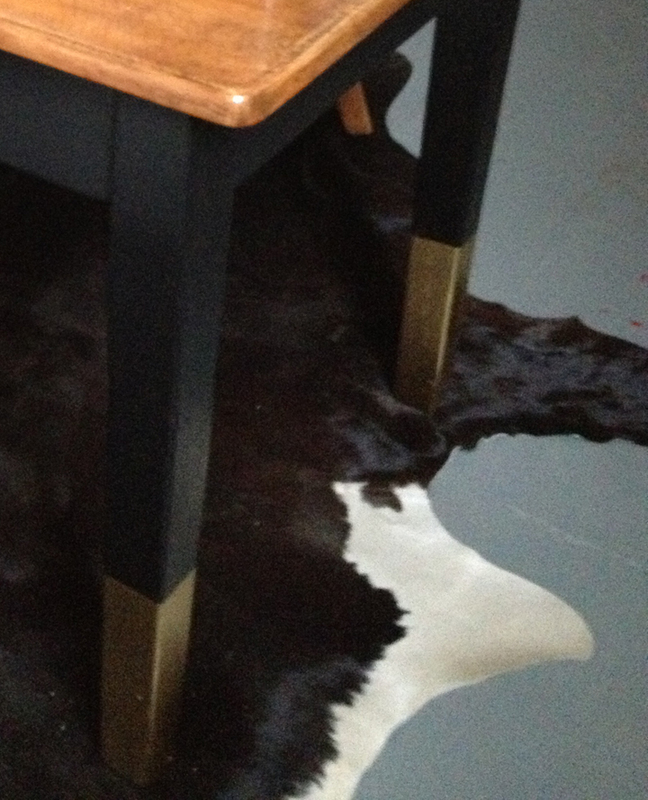 It was also painted in Lamp Black milk paint and waxed with Annie Sloan dark wax. It was originally army green. I think it is a lovey piece and can see it being used in many areas of the home. What do you think? It is available in my Etsy store and can be shipped or picked up at the studio. The painting was done yesterday and I am happy with, no, ecstatic about the color choice for the walls in the front area of the studio. The paint was a color match from Valspar called "Muted Ebony" we had it mixed up in Benjamin Moore eggshell...the rest of the walls are done in a cool, bright white for maximum light reflection. Photos tomorrow! !